Headaches gripped me again, thus I am unsure will I menage to finish planned projects for the hoard. Thus, I decided to try alternate projects, it would be a pity if we don't get a few Genet models variations. Yesterday I made decent progress, tomorrow I should have something worthy to show. Just a few texture acne to fix. Only the three tan parts are necessary to build the model, others are optional. Most of the time, people should not notice the difference between this and the full-bloodied model. can i ask if you designed this? maybe i am not understood well. I mean, did you make the drawing of the vehicule? And...if i would like to learn how to design papercrafts do you know ( or someone knows ) how i can start? thanks a lot Verming King for the info! First (and only) time in my live that I bought any kind of model, was his DVD archive. Sadly it disappeared during a big house cleaning. It was a whooping expenditure (for me) to purchase it, but I do not regret it. I would appreciate any reports of typos, errors, and if possible a test build before I link it in the hoard topic. Opinions and critics as well. And praise... lots of praise. Another color scheme. These two cover 99% of military and paramilitary uses. On the other hand, I think the world needs more poetry. Thank you for the feedback. I was aiming for a poetic strain. Long time has passed since I wrote stories or poems, so I couldn't help myself. 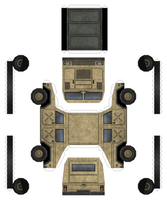 Teaser -> Stay tuned for a conversion of 6x6 APV in the following days. Do your need a rugged, utalitarian look for your new ride? Look no more, Imperial Grey is here! All the dull, depressive menace your heart desires. Doesn't 'Grey' sound more Imperial than 'Gray'? Good eye for details, you have! Recommendation acknowledged, and accepted. I edited my notes about color scheme names. Are you going to the lands of eternal ice? Is Vodka your favorite beverage? Do you call tundra your home? Look no more, Siberia is here! All the snowy, frozen-mud caked snowplow your heart desires. NOTE: The Siberia color scheme represents winter paintjob, with mud-infused snow coating. It has lower toner requirements than other color schemes, so is a good candidate if you print at home and need a large motorpool.